The Injury that Broke My Heart!! It's a bummer! what it all started as a sprint and olympic distance triathlon training, end up as training for a half iron distance. I never thought of trying such a distance, but with confidence gained over time and a bit of push from my coach and teammates, I decided to do it. I won't lie, but it took me over a month to decide to sign up for that race, but when I did it, I was excited, nervous and anxious all at the same time. I've been training very hard these past months. My biking has improved so much, that when I look back, I marvel myself with the saying that dedication and constancy are the key for success. After my previous race, I was having trouble with my left foot, however it got better and I did not feel pain any more. I thought that everything was perfect, but I got to visit the doctor anyways just to be safe. And here comes the bad news. 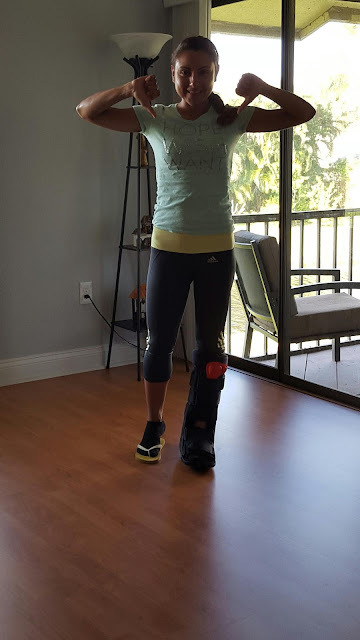 Two weeks prior my first 70.3 race, they found a stress fracture on my cuboid bone. I could no believe it and still can't. The doctor told me I could not do that race (and inside my mind I was thinking, he is crazy! I will do it, I don't feel pain). I did more research about it, and the more I read, the more I got scared of the long term effects if left unattended. I wish to continue training and competing, so I do not want to mess it up. Even though I though about doing the race, and in case of feeling pain during the run I will have to call it off, many insecurities came to my mind for a few days. A safe state of mind place a huge role during training and race for me, and I think for everybody. Last week during training I was having second thoughts, but I just kept ignoring it. Finally, last Monday during my swim session I almost crashed on tears, and no because of foot pain, but because I knew inside myself, that something was not right. Somebody told me to listen to my body, so that was it, body and mind are not connected at this stage, so I don't think the risk is worth it. I want to be healthy so I can run for a long time (and running is my strength so I want it to stay that way). With all the pain on my heart, I had to transfer the race for next year. It was a very hard day for me, I was very sad and thinking about all the work that I put on this, and the sacrifices that even my family make for me, so I can train all the time and that just broke me down. But thanks God, I have a marvelous husband who push me even when I am about to quit. He lift me up and even make plans for my strength training and next year races. Also, my teammates and coach were very supportive, so I feel less bad at the end. Right now, I am looking forward to recover my injury for 6 weeks and to train, to be back stronger than before, and as my brother told me: now you have a scheduled race for next year and you don't have to pay for it! hahaha!! !